Wishing the best for the cast and crew of Star Trek: The Next Generation (1987-94), who celebrate the 30th Anniversary of the premiere of their two-part pilot episode "Encounter at Farpoint." First airing on September 26, 1987 in the UK and perhaps a few other markets (September 28, 1987 in most parts of the US), Next Gen helped pave the way for a whole new epoch of science fiction and fantasy programming. At the time of its first release, Next Gen was considered a gamble, so much so that no TV network would flip the bill. So Gene Rodenberry and his production staff basically went rogue and broadcast directly through partner TV stations in syndication. This gave Next Gen a tremendous amount of rope to potentially hang itself with, since science fiction programming notoriously tends to go over budget and usually cannot survive longer than a season or two on the air. 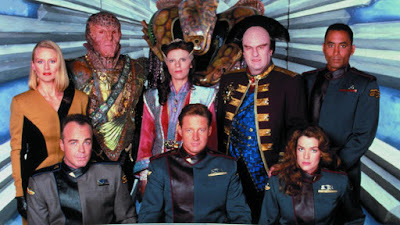 Funny enough, this expectation of impending failure actually enabled the show to hire on some very talented actors for the main cast, who might not have signed up for the show if they had known it was going to be a success and transform into a seven year gig, including Sir Patrick Stewart, Brent Spiner, and others. 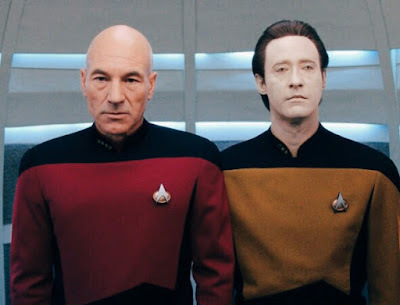 And in spite of some rough patches as the show developed its legs and had to lean a bit on the good will of the original series fan base, Star Trek: The Next Generation eventually learned to stand on its own as a thoroughly thought provoking and entertaining show in its own right. And although the show can occasionally come across a little stilted and dry, the show's true humanity shines through often enough to make it more than worthwhile viewing. Most fans will admit the show did not truly come into its own until the third season, but when it did, it did so with a vengeance and regularly produced compelling television that managed to remain relatively fun and family friendly yet still contain some sophisticated ideas and drama. 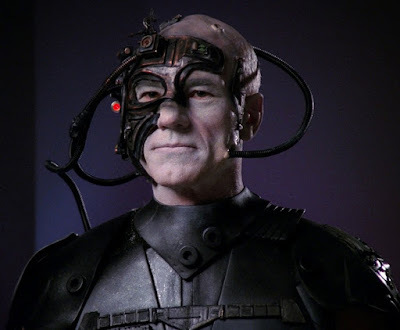 And the writers of Next Gen would even go on to develop one of the most thoroughly compelling concepts for a villain in science fiction history with the periodic arrival of the Borg. And as restoration efforts go, the team tasked with creating the HD masters for the Blu-Ray release performed one of the most impressive restoration efforts ever for a TV program. Now the show is ensured much greater staying power as new generations of viewers discover the show and enjoy its pristine transfer. 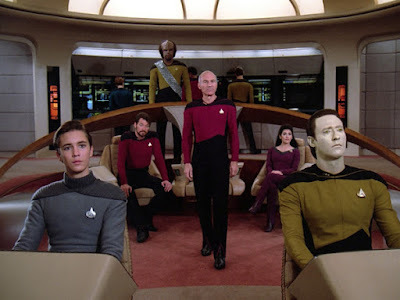 And although the episodic nature of the show and its varying degree of writing quality from episode to episode can be a little frustrating to deal with at first, particularly with some viewers who developed their tastes during the golden age of television, Next Gen is still definitely worth watching to this day, and for viewers of all ages. It has some deserved HUGO Award-Winning episodes for Best Dramatic Presentation and has some of the funniest, cutest, most thought provoking, and tragic hours of quality science fiction television. 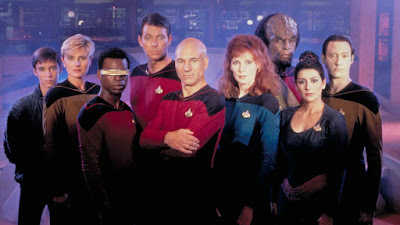 And Star Trek: The Next Generation (1987-93) was an important milestone in establishing a foothold for science fiction on television once again, helping to usher in a more sophisticated age of independently produced genre programming, like Babylon 5 (1993-98), Star Trek: Deep Space Nine (1993-99), Star Trek: Voyager (1995-2001), Lexx (1997-2002), and even Buffy the Vampire Slayer (1997-2003). 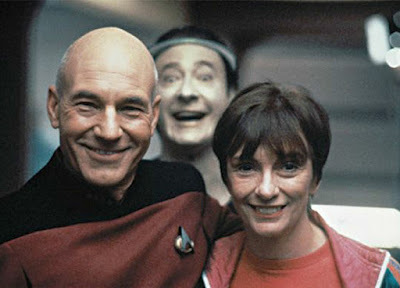 "Encounter at Farpoint" premiered on September 28th, not the 26th. On the maiden mission of the U.S.S. Enterprise (NCC-1701-D), an omnipotent being known as Q challenges the crew to discover the secret of a mysterious base in an advanced and civilized fashion." Ok, after further research, it seems that because Star Trek: The Next Generation did not have a parent network/studio, it broadcast in syndication on a number of random stations at random times. Different TV markets (regions) would broadcast ST: TNG on different nights of the week and at different times. It very well may be that many people viewed the premiere episode on Monday night "September 28" but that the syndication rights would enable broadcasters to broadcast the episode perhaps as early as Saturday night on "September 26" or at any other night and time that week. The information on this topic is sparse, but I am assuming IMDb is probably using the "earliest possible" broadcast date given to the syndication partners. Whether or not such earlier dates were ever used by anyone, or not, is unclear. But if correct, for many people, Star Trek: The Next Generation aired on September 28, 1987, on a Monday night). Although, if my operating assumption is correct, it might be possible that some people watched the premiere as early as Saturday night on September 26th or maybe even Sunday night on September 27th. If anyone has more accurate information to enlighten us, please share with us so we can know. Startrek.com says September 28th. The only place I'm finding September 26th is IMDB, and they make mistakes all the time. Something that may be causing a bit of confusion is that the show first premiered on BBC in the UK on September 26th 1990. Thanks for looking into that, Jakers. That would make sense.